Our garage used to be the place where we threw all of our junk. No one would go in there but us, so we would use it as a hiding place for stuff we didn't want cluttering up the house. You know what changed that philosophy? 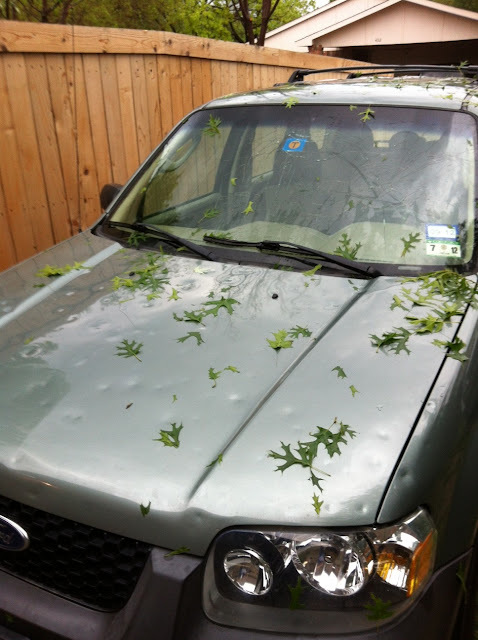 You see, if we had our garage reigned so that we could actually park in there, my car wouldn't have been totaled in a Texas-sized hail storm (which have proved to be at least a yearly experience). So when we bought the new car, we knew the garage would have to be cleaned up so we could protect my lovely Silver Bullet from falling ice chunks. Scott's truck is too long to fit into our 1979 garage, so there's no hope for protecting El Silverado! I have no idea why I just gave our cars cheesy nicknames. Let's blame it on the fact that I'm deliriously tired right now. Ok? The new car sparked "Mission: Clean the Garage, Part I." The husband's summer vacation boredom sparked Part II. Plus, we had two new bikes and nowhere to store them! Now the garage is looking very organized (compared to how it was before, at least). I must give my other half some serious credit for organizing all of his tools, and some of my artsy/crafty junk, into something very functional for us. My dad visited this past weekend and said he was now inspired to clean his own garage. Score one point for the son in law! First up, the workbench corner. This area was built into the garage when we moved in, complete with warped plywood countertop. The pegboards are critical to the organization of this area– and the whole garage. Thanks to the previous owners for putting up those peg boards! What's that silver thing up top? It's an upright fan that broke off from its base. Now it's perfectly positioned to circulate air in our garage, which you can imagine feels like a miserable sauna during 108+ degree Texas summers. Directly to the left is a wall with more tools on pegs. Cords, rope, saws, clippers, sanders, tree trimmers, funnel, wires. What more do you need? Continuing left, you can see how he solved the bike storage dilemma. Isn't it weird how it looks like I posted this photo upside down? You can see that this is the side of the garage where we don't store the car. What is the rest of the junk you're seeing in this photo? His DeWalt drill (awesome wedding gift), gardening tools, folding workbench, old dining table, bike rack, former dining room chandelier and an abandoned painting. Anything that's destined for Craigslist or a garage sale is housed right here. What can I say– we have junk and we have to put it somewhere! Even further to the left are the shovels, pitchfork, rakes and other "long" stuff. Once again, the pegs are saving the day. Oh yeah, and that's where the table saw hangs out in its free time. Directly across the garage is our paint cabinet. If it's related to house paints, it goes into this lovely thrift store cabinet. When is it worth it to waste a cabinet by using it in the garage? When you only pay $20 for it. The ladder and indoor cleaning supplies are stored right by the door that leads into the house. The ladder is hanging from a peg that attaches to the ceiling. Did you spot this random white cabinet full of golf balls a few pictures earlier? The husband got a little carried away and actually organized his golf balls by "quality." I think it's hilarious to have a cabinet of sorted golf balls! Who does that? Speaking of organization, this wire storage unit left behind by the previous owners has been very handy for sorting the little things everyone has in their garage. And of course, a drawer for lightbulbs. Scott is SO happy that his garage is organized. He's the neat and tidy one in our relationship. Back when we were dating in high school, it would bother him when I would just throw my jacket on the back of a chair or on some other piece of furniture. He'd go pick it up and fold it neatly for me. I thought it was so weird! He's way more relaxed about that stuff now– I guess I've rubbed off on him– but he does get incredible satisfaction from cleaning the garage and having an organized work space. Then again, who doesn't love an organized space? It's so calming and relaxing. Even a messy, creative, disorganized brain like mine can appreciate good organization– but that doesn't mean I'm good at it! How do you organize your garage? Are you a peg board person? Out of everything in our space, I would say the peg boards are the MVP. I'm sorry for posting less frequently this week– I've been in St. Louis all week for my yearly work convention. I'm very exhausted– I can't wait to fly back home tomorrow. Apparently the husband has been busy working on the house while I've been gone, so I can't wait to show you those projects next week! Have a *great* weekend.